Last Pirate: Island Survival for PC and mobile is an exciting action adventure game developed by RetroStyle Games UA. Just as the title implies, you take on the role of a pirate who is stuck on an island after a shipwreck. Separated from your love, you set out to find her and other crew members who are in danger and starving. You must strive to stay alive as well during the rescue mission. There is also a hidden treasure somewhere on the vast island. So, what will you pursue first? One thing is for sure; this game will put your survival and treasure hunting skills to the test as you explore a mystical island. You can never get bored of Last Pirate: Island Survival for PC or mobile because there is always something to do. While most survival-based games simply drop loot for players to collect, you have to craft items this title. As you explore the open-sandbox world, you can collect different materials. Gathered supplies will help you to build shelter, construction tools, and even hunting gear. You can drop your crafted items in the inventory and use them at any time. The crafting guide shows you what supplies to collect for making any item. Once you know what is needed, simply explore the island to farm for crafting supplies. The island might seem uninhabited and peaceful at first, but don’t be fooled. There are wild animals roaming all over searching for food and water. Watch out for them to avoid being attacked for invading their territory. 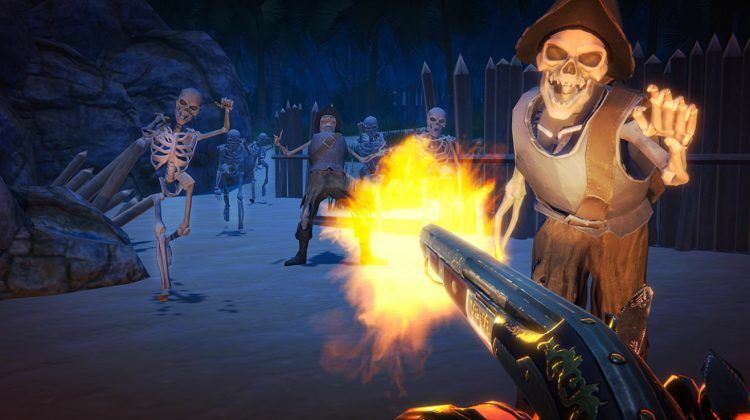 And when the sun sets, pure evil emerges from the shadows in the form of zombies and walking skeletons. The walking dead can attack you and even destroy your shelter. Better be prepared with a spear, sword, pistol, or musket to avoid being eaten alive. The pirate can die after an attack. Fortunately, you can revive him to continue playing. Watching a video will resurrect your character but you will have to start from scratch. If you want to save all the items in your inventory and progress made upon revival, then resurrect the pirate by spending coins. After the shipwreck, plenty of crates and barrels were scattered near the beach. Make sure to search for them. Open the crates and hack the barrels to see what valuable items might be hidden inside. You might find rope, tools, and other useful loot that is essential for survival. It’s important to eat and stay hydrated, especially after incurring injuries or running around the island for too long. You collect food or hunt for it. Eating will replenish your health. Pick up a “Bota Bag” as well to carry around water for drinking. Wild boars are a great source of animal fat and can keep you well fed. However, these animals inflict injuries with their horns when you get too close. Therefore, it is best to keep your distance by using weapons like a bow and arrows instead of hutting from close proximity and risking injury.